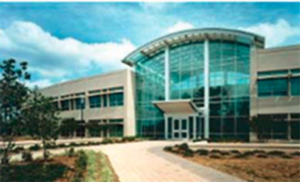 The US Environmental Protection Agency at Research Triangle Park (RTP) in Raleigh, NC is the major center for air pollution research and regulation. It is also hosts the EPA’s National Computing Center (NCC), one of the largest computer centers in the US, which provides large-scale computing services for EPA nationwide. RTP Campus consists of 133 acres and over 1.2 gross square feet and is the largest facility ever designed and built by the Agency. It is home to over 2,000 employees, the most outside of Washington, DC. AED assisted the EPA on improving the energy performance of the computer wing. An extensive, third-party review of the data center’s operating conditions resulted in EPA shutting off six of the facility’s 13 computer room air conditioning units, while still meeting the sensitive cooling needs of the computer equipment. AED is implemented a new HVAC system to optimize and diversify the location of energy-intensive equipment to better match heat loads and cooling capacities. EPA anticipates these projects will help reduce NCC’s annual energy intensity by approximately 4 percent compared to FY 2009 energy intensity. “Green” lighting features, including high-efficiency fluorescent lighting, motion sensors, daylight dimming sensors, and manual override switches, save 70 percent on electricity used for lighting when compared to the energy consumption of a facility with conventional fixtures. AED is managed the EPA RTP’s Environmental Management System. Environmental Aspects that are regulated or have been scored as having significant environmental impact are Chemical Use, Wastewater Generation, Water Use, Energy Use, Fuel Use and Vehicle Emissions, Solid Waste Disposal, Paper Use, Excess Property, and Electronics Equipment.